And it’s no wonder: it’s a demanding, full body workout that lets busy women crank up the intensity, forget their to-do lists and relationship drama (or vent about them! ), and get the most out of their sessions. Case in point? All of the Victoria’s Secret Angels and runway models like Adriana Lima, Karlie Kloss, and Romee Strijd, and Gigi Hadid, who can’t get enough boxing. Get inspired by their badass fitness prowess and snaps here. Rosie Huntington-Whiteley punches her way to perfectly-sculpted arms. Karlie Kloss hits the heavy bag in a personal training session. Romee Strijd makes time for a pre-ring selfie. Adriana Lima works the speed bag with Aerospace co-owner and former professional boxer, Michael Olajide, Jr.
Victoria’s Secret model Kelly Gale models her serious jab cross, sans gloves. Michaela Kocianova jokes around with trainer Rob Piela, owner of Gotham Gym. 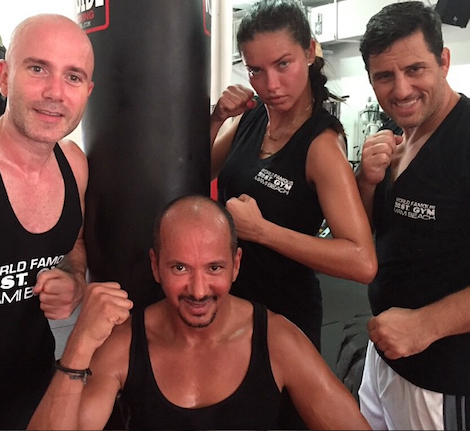 Sara Sampaio knows that if you didn’t Instagram your trip to Gotham Gym, it didn’t happen.